Plants in the Ground! Plants in the Ground! 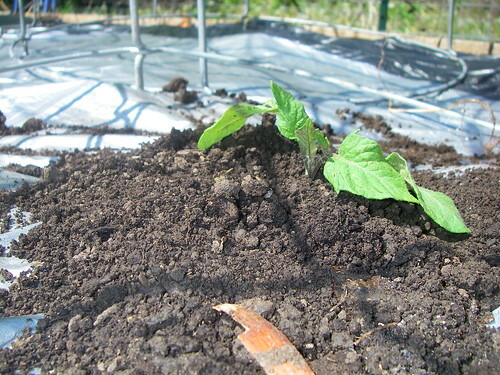 It’s time to get those tomato plants in the ground! Ok…it’s not quite May 1 yet, but I had the day off to go fishing and these 40 mph winds kept me off the lake. No point in wasting the day…so PLANTS IN THE GROUND! We are still at a slight risk for frost, but the long term forecast is looking good…lows in the 50’s. I thought I’d give a tutorial on how I plant my tomatoes. I’ve learned a lot from other tomato growers and kind of use a combination of their methods and my works for me…use what you want…just follow some basic steps to make sure your tomato beds get off to a great start! Step one is always make sure your soil is in great condition. I always add a few wheelbarrow loads of compost to my beds each year. I then till it into the top 4-6 inches of soil. I don’t till deep once my beds have been established…just some light mixing of soil. If your beds are compacted, you can add some Perlite and or Vermiculite to them as well and till that in, but don’t do it on a windy day or it will blow away before it hits the ground. For tilling, I’ve always recommended the Mantis, but after having carburetor problems with it for a few years, I sold it cheap and bought a Troy Bilt Corded Tiller. The reviews for it on Lowe’s and Amazon were stellar, so I took the plunge and bought the tiller for a little less than $200. You have to be within 200 feet of electricity to use this, but you will be very impressed with how well this thing works. It looks like a toy, but it does everything the Mantis ever did with a fraction of the noise and much less jumping. It will turn your soil into a fine powder in just a few minutes. I can’t say enough good things about this machine! One note about tilling…NEVER NEVER NEVER till your soil when the soil is wet. You’ll end up with hard compacted mud clods that will take years to break down. Wait until it dries out before tilling. 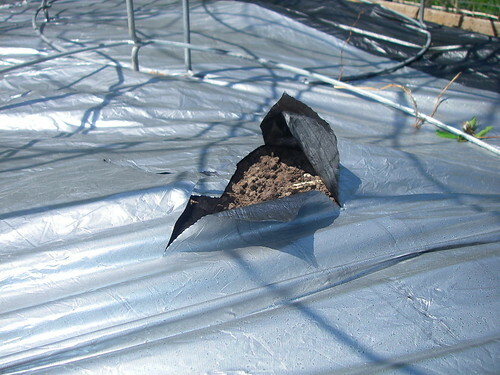 Ok…once that soil is ready to go, I like to use Silver Reflective Mulch Film to cover the beds. Don’t ask me where to get this stuff as it’s almost impossible to get. I’m still working from a roll I bought 2 years ago, but will need more next year. I’ve been playing phone tag with a salesman for weeks now just trying to see if I can buy it. If you don’t use SRM, you can use the red mulch film that’s commonly available. If you don’t want to use the plastic film, use straw or grass clippings, just make sure the mulch doesn’t stay in contact with the stem of the plant. The message is…whatever you do…MULCH! This is the bed I planted this morning. Notice the Texas Tomato Cages already installed before I plant. These cages are a bit pricey, but well worth the investment I think. If you’re growing open pollinated tomatoes, make sure you have sturdy and tall cages. 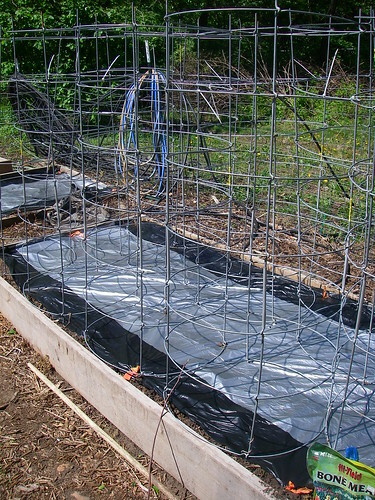 Don’t waste your money on the cheap wire cages for tomatoes…these plants can get up to 6-8 foot tall and have heavy fruit loads that will bend the flimsy cages like a paperclip. I also use concrete reinforcing wire cages that are much cheaper, but just as effective (not as cool though!) as the TTC’s. 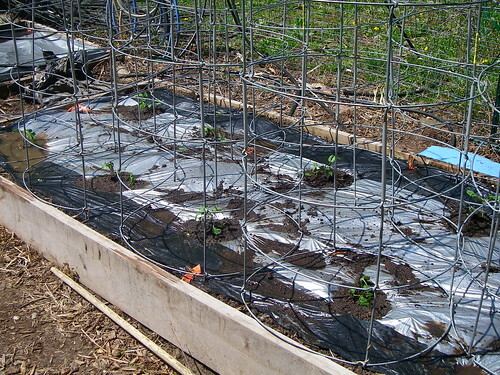 You can also stake your tomatoes with a large wooden stake driven into the ground, and tie the plant to it as it grows, or you can let them sprawl across the ground, but I prefer cages because they require a lot less work during the summer as the plant grows rapidly. Whatever method you choose, put the supports in before you plant or very soon after. 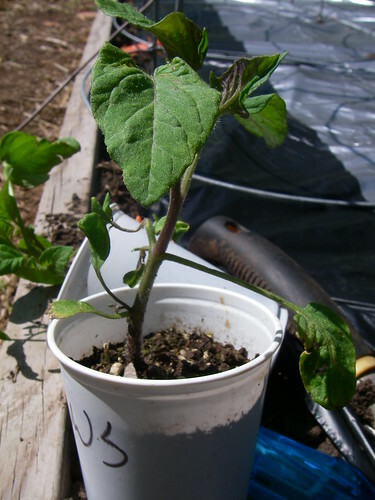 It’s not a great idea to pound a stake through the root system of a developing plant or trying to slip a cage over a plant once it gets bigger. Some basic supplies you’ll need: Tomato plants (DUH! 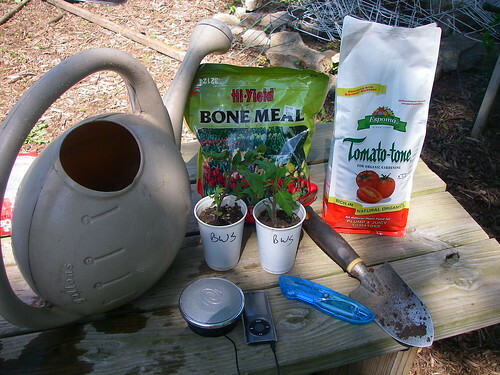 ), a good trowel, bone meal, TomatoTone (optional), a box cutter to cut the plastic film if you use it, an MP3 player with the wonderful sounds of Cake playing in the background (optional!) and plenty of water. Avoid watering tomato plants directly from the hose. Cold water an chlorine aren’t that good for your plants. I use rainwater from my rain barrels. If you’re interested in getting a great rain barrel, contact my friend Rhae and she’ll get you a great barrel! If you use water from the hose, it’s a great idea to put into watering cans or milk jugs and let it sit a day or two to evaporate any chlorine and to warm up a bit. Trust me..your plants will love it! I like to toss in a pinch of bone meal and a pinch of TomatoTone into the planting hole before I put in my plant…just an added boost to get those babies off to a good start! If you have dogs around your garden, they might enjoy digging up the bone meal, so fence accordingly. Make sure you space your tomatoes at least 2 feet apart. 3 or 4 feet is better, but no less than 2 feet. These plants get big and need plenty of room for their roots and for their foliage. Crowding plants will give you less yield and may lead to fungal diseases if the plants can’t get enough air circulation. Spread them out! Before you dig that hole, get your plant and pinch off all but the top set of leaves. Just use your fingers and pinch them off close to the stem. Hold the plant upside down in your hand and give the container a couple of squeezes and the plant should slide right out. Dig your hole deep enough so that you can bury the entire stem right up to that top set of leaves. If you can’t dig a hole that deep, you can dig a trench and then prop up the growing tip with some soil, but dig deep if you can. Before you put the plant in the hole, toss in that pinch of bone meal and a pinch of TomatoTone if you have it. If you use fertilizers for your garden, make sure you use one that is fairly balanced in NPK…avoid fertilizers with high Nitrogen content because this will cause lots of foliage growth at the expense of fruit production. Put your plant in the hole and then fill it back in with the soil you dug out. 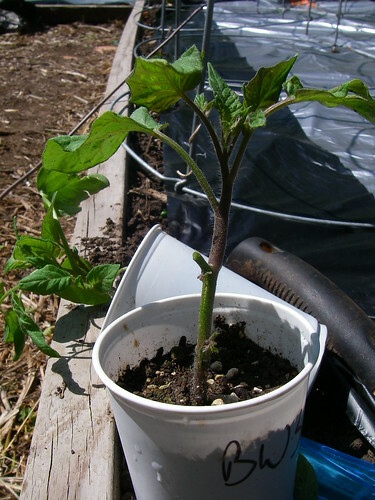 Take care not to use tools for this part of the process as it is easy to break that seedling with a trowel. Also make sure you don’t leave any big gaps in the soil…firm it in there with your hands and dust any soil off the leaves. When you get done, you should have a nice mound of soil with only the top of that plant sticking out of the ground. Right after planting, water your plant in well. I water each plant three times to make sure all of the ground is soaked deeply. This helps reduce some of the transplant shock and fills in any gaps in the soil. In the pic below you can see my bed is planted and the plants are soaked! If cutworms are a problem in your garden, you can also put a small cardboard collar around your plants. Well…that’s the basics of how I plant my garden. If you have any questions, feel free to ask and I’ll do my best as always to help make those Kansas City gardens successful! Another reminder to mark those calendars for August 7th for the Tomato Tasting…I’ve already reserved the shelter on Roe. This year should be even bigger and better than last year! That was great James, thanks! We planted a square foot garden and we were planning one tomato plant per square foot, but maybe we’ll try to space it out a bit more. With the cherry tomatoes you and Kathleen bought, you can put them a bit closer than 2 feet. They are so super productive, that you won’t notice a huge difference in productivity probably. The vines are pretty wispy though, so plan on them getting tall and/or long. Crowding them too much might make you more likely to get fungal diseases…just make sure you prune all foliage that touches the ground and you’ll be better off.